A selection of Chinese greens: baby bok choy, Chinese broccoli or gai lan, and in the back, snow pea shoots. 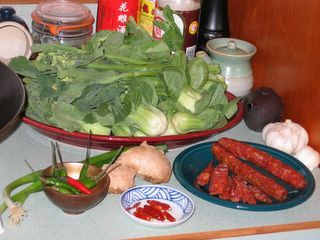 The sausages in the green dish are lop cheong. In ruminating on the Appalachian tradition of cooking greens with pork, I was reminded of how I got Zak to eat greens. It did involve cooking dark leaves with piggy bits, but not in the traditional Appalachian country style I had grown up with. It came about by riffing on the Chinese way of cooking and eating greens. The Chinese love greens as much, perhaps more, than hillbillies do. I discovered this years and years ago when I was working as a waitress at The China Garden restaurant in Huntington, West Virginia. It was the end of lunch shift, and everyone was pausing in our preparations for the dinner shift to have some lunch. There were three of us waitresses working: Heather, a tough-talking but good-natured native West Virginian who had grown up in Columbus, Ohio, June, a young Chinese immigrant who had been a nurse and was working as a waitress to put herself through nursing school in the States, and myself. We had dished up some of whichever lunch special appealed to us and sat down at a table together to eat. Heather and I bantered together, while June, who was very sweet-tempered, laughed at our risqué jokes. Mei, the chef-owner’s wife, came out of the kitchen with a small platter, and came to our table. We smelled something dark and delicious, and Heather and I, ever the adventurous eaters, looked up eagerly. “Whatcha got, Mei?” Heather asked, leaning forward to get a better look. Mei waved her hand, as Huy and the rest of the kitchen staff came out and sat at the back table, carrying platters and bowls of rice. Huy was watching us as he sat down and began tucking into his bowl of rice. I watched as she set it down and deeply inhaled the perfume of toasted sesame oil. It was some kind of greens, cooked until barely wilted and bathed in a shining sauce. To call them verdant was an understatement–they were colored in nearly obscene shades of brilliant green. My nose twitched. They smelled really good. I shifted in my chair to look past Heather’s shoulder, and saw not only Huy, but Lo and the rest of the kitchen staff watching us intently. I shrugged my shoulder and picked up my chopsticks. Heather had beaten me to the first bite. “Oh, Mei you know how Barb and I are. We’ll try anything once, right?” She plucked up a choice stalk with her chopsticks and popped it in her mouth, and chewed slowly. Mei, June and I watched her. She swallowed, nodded her head and said. “Mmmm. Tastes like grass.” A satisfied smile quirked the corner of her mouth. June had been watching all of this with interest. She took up a very small bit of it and put it in her mouth, biting down on the crisp stalk. Instantly her face puckered and she shuddered, shaking her head. “Ooooh,” she exclaimed, her voice tinged with disbelief. “Tastes like grass.” With that, she shook her head and pushed the platter away from herself and toward Heather and I.
June blushed and shook her head, laughing. “No, I don’t like grassy things,” she said to Mei. June switched into Mandarin to answer Huy back and the banter between the two tables flowed around Heather and I, a river of words and laughter we could not parse. But we didn’t care. We had greens, and we ate the entire platter contentedly. Years later, I decided that it was high time that Zak learn to like greens. I decided to use his love of Chinese food to my advantage, and bought several varieties of green leafies, and began cooking them in a hot wok with sliced garlic, dressing them simply with a bit of sugar, some wine and light soy sauce, and a dash of rice vinegar. When they were done, I would drizzle sesame oil over them and scrape them out of the wok onto a waiting heated platter. My greatest coup was getting him to eat kale. I happen to love lacinato kale–a variety that has fairly tender, wrinkled ovoid leaves with crisp but not tough center veins. I had some lop cheong–dry cured Chinese pork sausage that has a good bit of sugar in them, so I diced it very small, and minced up a clove of garlic with an equal amount of fresh ginger. I cut the kale crosswise into thin ribbons so each slice had a bit of the crisp center rib. I heated up my Cantonese style cast iron wok which I had recently bought from The Wok Shop in San Francisco, and tossed in the minced aromatics and the diced sausage. I cooked them until the sausage had started to brown and the garlic was golden, then added a drizzle of homemade chile oil with seeds and added the kale. I stirred like mad, letting the kale quickly wilt, and shook a bit of thin soy sauce into the wok along with some chicken broth. A sprinkle of sugar and a dash of chianking black rice vinegar finished the greens, and onto the platter they went. They were by turns sweet, sour, smoky, gingery and garlicky. The sausage had rendered their fat so everything was coated with a porcine richness that exploded on the taste buds every time you bit into a piece of it. It was an unqualified success. At a subsequent visit to the Columbus Asian Market, I picked up more lop cheong, and was replenishing my supply of greens. A little Chinese grandmother glanced into my cart and asked what I was going to do with the sausages. I told her about cooking them with greens. She thought it sounded like a good recipe and said she might try it herself. In the meantime, she pointed out the pea sprouts and asked if I knew what they were, and we were launched on a bilingual discussion of greens, how to buy them, how to cook them and what ailments they were good for curing. Which was fine, except we were slowing down the traffic in the produce section. Time and again, in my multi-ethnic explorations of food, I have found that the culinary arts can become a bridge that brings people from very different backgrounds together. Food is a language that transcends linguistic and cultural boundaries, and when two native speakers of the culinary mother tongue come together, impassioned communication results. We can see that while we may have grown up on opposite sides of the planet, we have something in common which we both love. A simple plate of greens. Great story – I love bok choi myself. Growing up in Auckland we got to eat quite a lot of Chinese food. My father (the cook of our family) loved Chinese supermarkets (about the only type of shopping he did enjoy!) and Asian food so we ate it quite often (he did brilliant Thai food too). I cook Thai food fairly often, too; I fell in love with it at first taste about oh, twelve or thirteen years ago. Unfortunately, where we lived there were no Thai restaurants. But there was a well-stocked Asian grocery store, so I started teaching myself. Between books and long conversations with a couple of Thai graduate students, I got pretty proficient. Good enough to teach other folks, which is fun. It is a lovely cuisine, isn’t it? We were fortunate. There’s some very good Thai restaurants in Auckland (or were 7 years ago). Dad also went on a short cookery course when he went to Thailand on holiday – food obsessiveness runs in the family! [laugh] He taught me how to make green curry chicken, everything else I learnt out of a book or the web. Ahh, green curry. One of my most popular classes when I taught in Maryland was a class I taught on green curry. We made green curry paste from scratch, by three methods–machine only, by hand only and by hand assisted by machine, and evaluated which method was preferred–every one decided by hand assisted by machine. Then, we used it in three recipes–green curry chicken, green curry with fried tofu and eggplant, and salmon filets glazed with green curry and broiled, then garnished with avocado and steamed shrimp slices. The last, totally non-traditional recipe was the runaway favorite. Yeah, the Chinese love their greens. Interesting combination of lap cheong and vegies, usually we take lap cheong in Fried Rice or eaten with waxed duck steamed with rice as a Chinese New Year dish. Reading the way you wok your veggies, you have got it down to pat esp the adding of the sugar. We tend to add sugar to things like kailan as it helps bring out the flavors. Try adding some minced ginger to your garlic as that will add more flavor. Another popular way we take veggies is in a soup base (less oil). I think I blogged about that twice – the baby spinach and the little bok choys in the restaurant. Hey, Boo–I do use ginger in some greens. To me, baby bok choi doesn’t taste right at all without ginger. The same with gai lan. And yeah–I figured out to use some chicken broth as the “sauce” instead of so much oil, in making some greens. Chicken broth being a necessary ingredient in the Cantonese kitchen, especially, that a lot of Americans don’t get.